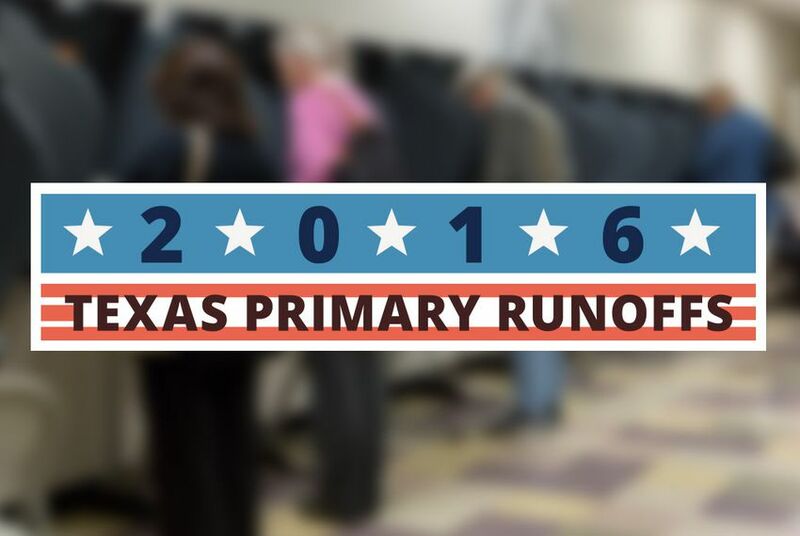 A lack of a compelling statewide race at the top of either ticket kept participation in Tuesday’s party primary runoff elections squarely at the lackluster level. The Republican race for a spot on the Railroad Commission drew the most participation with a bit more than 377,000 votes cast. Compare that to the U.S. Senate runoff election from four years ago where more than 1.1 million Republican voters showed up on the last day of July to lift Ted Cruz to victory over David Dewhurst. Wayne Christian was winning the Railroad Commission contest over Gary Gates but by less than 2 percentage points as of 1 a.m. Christian will face off in the fall against Democrat Grady Yarbrough who won his runoff contest last night. The contest, though, that drew the most attention heading into Election Day was a State Board of Education contest. That was because the candidate who won in the first round of the primary elections, Mary Lou Bruner, became notorious for her posts to Facebook, the most infamous of which related her belief that President Obama had worked as a gay prostitute as a young adult to fund a drug habit. But as the Tribune’s Kiah Collier reported, Bruner lost last night to Lufkin school board president Keven Ellis. Collier wrote that the “East Texas Tea Party activist and former schoolteacher had been favored to succeed in the race after nearly winning the March 1 primary outright and accumulating heavy support from influential conservative groups that typically hold big sway in low-turnout runoff elections. In another notable development, two House GOP incumbents — Doug Miller of New Braunfels and Wayne Smith of Baytown — were headed for defeat. Watkins added, “The two victories (by the challengers) likely won't affect House Speaker Joe Straus' hold on the 150-member, GOP-dominated chamber. Enough Straus supporters won their primaries in March that it's unlikely that a serious challenge to his leadership will emerge. And in a couple of GOP runoff elections for open Texas Senate races, Mineola state Rep. Bryan Hughes defeated his House colleague, David Simpson, in one race while Austin ophthalmologist Dawn Buckingham defeated Abilene state Rep. Susan King in the other contest. Analysis: A Lousy Turnout for a Lackluster Texas Runoff, by Ross Ramsey — If you’re the sort who rides your friends for shirking their civic duty by not voting, let up a bit. Tuesday’s was, by almost any measure, an election of limited statewide importance. Scott Walker — No, Not That One — Wins Court of Criminal Appeals Runoff, by Madlin Mekelburg — A candidate who ran a low-key campaign and shares a name with the governor of Wisconsin won the GOP runoff race for a seat on Texas' highest criminal court. Christian Defeats Gates in Railroad Commission's Republican Runoff, by Johnathan Silver and Jim Malewitz — Former state Rep. Wayne Christian won the Republican nomination late Tuesday in the race for Texas railroad commissioner, edging out Houston-area real estate mogul Gary Gates in a race that turned heated in its final stages. Two Texas House Committee Chairmen Fall in GOP Runoffs, by Matthew Watkins — Two committee chairmen from the Texas House of Representatives were defeated in Tuesday's Republican primary runoffs, dealing a small victory to anti-establishment conservatives frustrated with the leadership of the lower chamber. Arrington, Gonzalez Decisively Win Congressional Primaries, by Abby Livingston — Voters in the state's primary runoff elections put two Texans, one Republican and one Democrat, on track to join the state's delegation in Washington, D.C. In Texas Senate Races, Hughes and Buckingham Win Republican Runoffs, by Edgar Walters — Two new Republicans are poised to claim seats in the Texas Senate: Travis County eye surgeon Dawn Buckingham and state Rep. Bryan Hughes, R-Mineola. Keven Ellis Defeats Mary Lou Bruner in State Board of Education Race, by Kiah Collier — In a stunning comeback, State Board of Education candidate Keven Ellis won a Republican primary runoff over Mary Lou Bruner, who drew national attention for objectionable social media posts. Turkey Follows Through with Complaint Against Harmony, by Kiah Collier – A law firm working for the Republic of Turkey is accusing Harmony Public Schools of funneling money to an organization the Turkish president has accused of trying to overthrow the government. Harmony says that's preposterous. Amid Reports of Starr's Firing, Baylor Says Expect Announcement Soon, by Matthew Watkins – Amid reports that Baylor University President Kenneth Starr was fired this morning over the university's handling of sexual assault allegations against football players, university officials said the results of an internal inquiry are forthcoming. In High-Profile Case, Texas Defends Its Voter ID Law, by Jim Malewitz – Texas Solicitor General Scott Keller warned the U.S. 5th Circuit Court of Appeals Tuesday that “all voting laws could be in jeopardy" if Texas' voter ID law is struck down. A&M, UT Will Vie to Co-Manage Sandia National Laboratory, by Matthew Watkins – Texas’ two biggest university systems are teaming up to try to win a massive federal contract to manage the Sandia National Laboratories in New Mexico, one of three labs in the country that maintain the nation’s nuclear arsenal. Who Said It: Donald Trump or Mark Cuban?, by Rodney Gibbs and Madlin Mekelburg – While he says he’s open to being a running mate for either Hillary Clinton or Donald Trump, Dallas Mavericks owner Mark Cuban often sounds more like Trump. See if you can tell the bombastic billionaires apart in our quotation quiz. • The House Committee on Transportation meets at 9 a.m. in the Capitol extension to discuss updates from the Texas Department of Transportation and the Department of Motor Vehicles on relocation issues, toll revenues and maintenance projects. • The House Committee on Homeland Security and Public Safety meets at 10 a.m. in the Capitol extension to discuss the dissemination of criminal records from public entities with the House Committee on Government Transparency and Operation. • The House Committee on Government Transparency and Operation meets at 1 p.m. in the Capitol extension to discuss issues relating to information held by former government employees, systems for handling repetitious or redundant requests for public information and how to protect small governmental bodies from financial burdens by such requests. • The House Committee on Homeland Security and Public Safety meets at 1 p.m. in the Capitol extension to discuss penalties for operating commercial motor vehicles in violation of safety standards and the role of local authorities in enforcing these standards. • The House Transportation Select Committee on Long-term Infrastructure Planning meets at 1 p.m. in the Capitol extension to discuss transportation funding and methods used in other states to find transportation infrastructure. "The tide has turned against these laws. The jig is up. Nobody really believes anymore, if they ever did, that this law actually has something to do with voter protection." — Attorney Chad Dunn, representing plaintiffs in Texas' voter ID challenge, on the five-year-old identification law ahead of Tuesday's hearing in the U.S. 5th Circuit Court of Appeals in New Orleans. Medicaid changes could hurt epilepsy patients, by Sindi Rosales and Donna Stahlhut — Changes to the list of covered prescription drugs, known as formularies, would allow insurers — not physicians — to determine what medications managed care plans would cover. These changes, intended to cut costs, could result in medical complications that hurt the vulnerable people served by the Medicaid program and cost the state more in the long run. • A Conversation with state Sens. Kel Seliger and Kirk Watson on higher education funding in Texas, on May 26 at The Austin Club.